"Prelude was introduced by Hornsea Pottery in 1980 and discontinued in 1981. A very short production run. 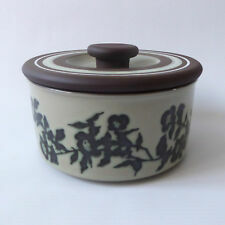 A lovely lidded round butter dish by Hornsea Pottery, c1980. I would say this is more 'mushroom' or 'taupe' background than a 'mint' background! Marks: sugar bowl: 'OVEN TO TABLEWARE, HORNSEA ENGLAND, DISHWASHER, FREEZER AND MICROWAVE OVEN SAFE, CIRRUS' and milk jug: 'HORNSEA, ENGLAND, CIRRUS'. This is a rare Hornsea Pottery lidded sugar bowl & milk or cream jug in the beautiful ethereal Cirrus design. Hornsea Pottery, Yeovil fruit design ceramic cups & saucers x6, tea/coffee. 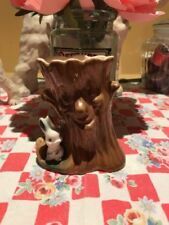 Hornsea Pottery, Yeovil fruit design ceramic cup & saucer, tea coffee 7cm 15cm . Dispatched with Royal Mail 2nd Class. x6 tea cups and x6 saucers. No chips or flakes very good condition. Hornsea Milk Jug. This milk jug has a white background with a fine red stripe and the wordMILK in bright red lettering. Approx 7 x 8.5cm H x W cup 15cm saucer. Porcelain and China. All pieces have moderate to significant glaze crazing. All usable but show much wear. DALESMAN MUG. ". A ROUND TUIT " ( VERY RARE ). The colour is dark purple with blue footing. Mug is made in glossy cobalt blue and gilt pattern (difficult to photograph because of reflective quality). Buy It Now - a highly collectable item. Hornsea, England, 1981. For sale is a collectable plate. On offer are two Hornsea Pottery pots can be used for sugar/jam or ramekins as oven to tableware. Designed by John Clappison. 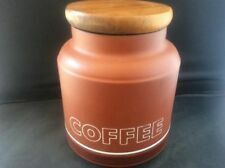 Small pot measures approx 6cm tall and 8.5cm diameter, larger pot measures approx 6cm tall and 10cm diameter - both in good condition with no chips or cracks.